After you've loaded the UV template into Photoshop, we'll begin painting the texture. We'll start with the head because it has the most detail. Select the loaded head template. The first step is to create a base texture that covers everything. 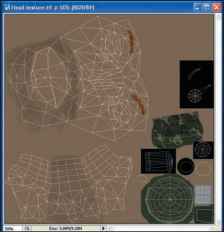 This base texture should be the most common material for the object, such as a leather texture for the boots or a skin texture for the arms. 1. 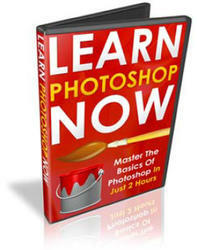 Fill the entire layer with skin tone color by selecting the color and using the Edit, Fill menu. Then select each item in the UV map and change its base color. Use black for the earphones, camera, and microphone; brownish green for the helmet; and white for the teeth (see Figure 6.20). 2. Apply the Noise filter, about 5 percent monochromatic. This adds some texture to the colors. 3. Make a few adjustments to this base texture, such as clicking Image, Adjust, Hue/Saturation, and desaturate the texture enough so that the colors don't burn a hole in your eyes anymore. A slight Levels adjustment would be good, too, just to sharpen it up and tone it down. At the end, we'll make last-minute adjustments like this to get the texture looking good. Figure 6.20 The head mapping with all the base colors applied. 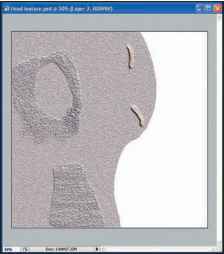 I don't recall mentioning this next technique thus far in this book, but it's a fantastic way to create realistic bump maps in skin and cloth. You can fake the brows that shield the eyes using this technique. You can also use this technique to create muscular folds in the skin. If you're not big into freehand art, like me, you'll appreciate this one to its fullest. 1. Create a new layer above the base layer. Apply an Inner Bevel style to this layer, with settings shown in Figure 6.21. You'll be using this style to bump the texture map for the remainder of this tutorial, so you should save the style in the Styles palette for quick retrieval. The most important part of the bevel here is the Highlight Mode's color—change it from that hideous pure white to a dark greenish brown. Then change the Blend Mode to Linear Burn. The highlights and shadows should be dull and subtle; otherwise, your bumps will look like silly streaks of paint. Figure 6.21 Create this Inner Bevel style and store it in the Styles palette for quick retrieval. We'll use this for bumping the surface. seems to raise magically! You can always adjust the effects of this by going back into the style for that layer and adding more depth, larger size, and so on. Plus, if you totally screw it up, just Ctrl+A that layer and delete the pixel contents to start anew. When doing almost any texturing operation like dodging, burning, or even painting, remember to turn the settings for those tools way, way down, like less than 10 percent. This way, there won't be dramatic changes that look totally goofy. Figure 6.22 Use the Clone Stamp tool to brush in a brow on the effects layer. I really hope I opened up a world of possibilities for you with this technique. You can use it to create muscle peaks and valleys on the legs, arms, and body. The thing is, you really need to be subtle about it, or your character will look like he got the #[email protected]$?! beat out of him! Anyway, when you're finished with one brow, merge it down to the base layer. Hicks looks a little meaner now, doesn't he? The sketch of Hicks demonstrates that his beard including the underside of his neck is coarse and thick, as if a beard could sprout at any time. Accomplish this look by preselecting the bearded area on a new layer and then painting in the stubble with a pattern brush. 1. Use the Lasso tool to circle the facial area just under the nose and around the chin. Then select the Subtract from Selection option in the toolbar and drag over the mouth area. Finally, select the front of the neck area with the Add to Selection option. Figure 6.23 shows the selected area where the beard stubble will be applied. 2. Select the Scattered Dry Brush Small Tip brush from the Wet Media set of brushes. Set Flow to about 50 percent, and drag in slow steady strokes that follow the way the beard flows outward from the moustache and downward along the neckline (see Figure 6.24). Figure 6.23 Select the area where the beard stubble is located. Figure 6.24 Draw in beard stubble with a scattered pattern brush. Before leaving the head, there are plenty of last-minute touches that we can add to the texture. Any little details that we can add will help the character feel more real. 1. In the base layer, we quickly added base colors to the various items, but a solid base for the helmet eyepiece won't work. Select the eyepiece and fill it with a black color that is mostly transparent. Opacity set at 30 percent should let the eye be visible through the glass. 2. The neck guard on the back of the helmet is a good place to add a patterned camouflage look. 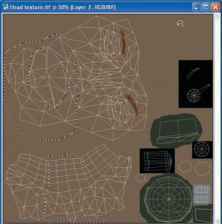 Select the camo.jpg image from the Chapter 6 folder on the CD and fill the neck guard with this pattern in the base layer (see Figure 6.25). 3. 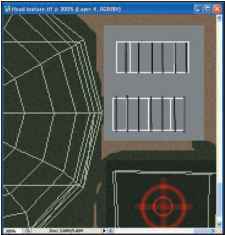 Select a red color and draw in two circles with some crosshairs in the center of the eyepiece for a targeting device (see Figure 6.26). 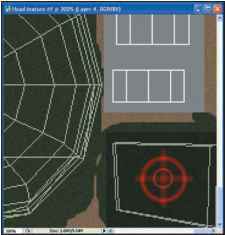 Figure 6.26 Draw in a red targeting set of crosshairs in the helmet eyepiece. 4. Add some thin vertical lines to the teeth to separate the row of teeth into individual teeth (see Figure 6.27). Figure 6.27 Thin black lines separate the individual teeth. file that you can easily load into Max. I like to use the TIF format. There's not too much going on here. When you're finished with this step, use the Dodge and Burn tools to touch up the edges and center of the neck area, as with anything else you do. Always take your time putting finishing touches to your work. Nothing's really ever just 1-2-3, you know? If you notice that I explain something but the results seem much better than what I explain, that's because I took a few extra minutes to polish it off, adjust the levels, and so forth. 1. 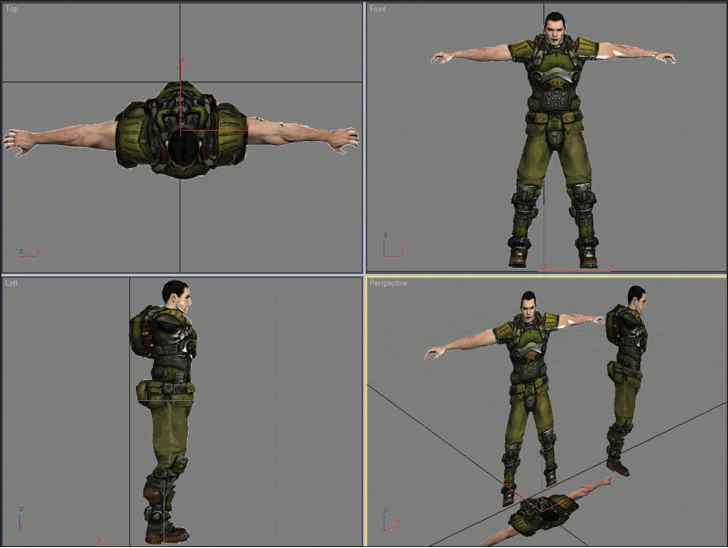 Now let's create a displacement map so that we can selectively bump the surface of the individual sections of Hicks' body. Press Ctrl+A to select the entire Base layer, and then press Ctrl+C to copy it. Go to the Channels palette, create a new channel, and paste it with Ctrl+V. Adjust Levels to make the pattern a bit brighter and crisper. 2. Now go back to the base layer. According to the UV layout, for the head, you'll want to apply a bump map to the face details only, so select the Lasso tool to select the face parts. To this selection, apply Filter, Render, Lighting Effects, using the new Alpha 1 channel that you created as a displacement map. I used a Directional light type, at a slight angle pointing from top-right to bottom-left. Play around with this filter to get desired results. We're trying to achieve a pitted, scaly skin look. 3. 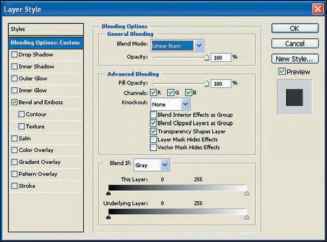 Choose the inverted selection using the Select, Inverse menu, and fill the inverted selection with white (see Figure 6.28). Then save this image as the head bump map to be applied to the head's bump map channel. Figure 6.28 Render the Base layer using its copy as a bump map. Figure 6.29 Start making the eyes by filling an elliptical selection with a Clouds mix of blue.